Forget dying Easter eggs. Antigua Guatemala dyes its sawdust—and then uses it to make some of the coolest carpets you’ll ever see. As elaborate and individual as they are ephemeral, alfombras are carpets that adorn the street routes of church processions during the season of Lent. A religious offering, they’re made by hand—often with sawdust—in whatever design the maker fancies and just hours before the procession’s arrival. 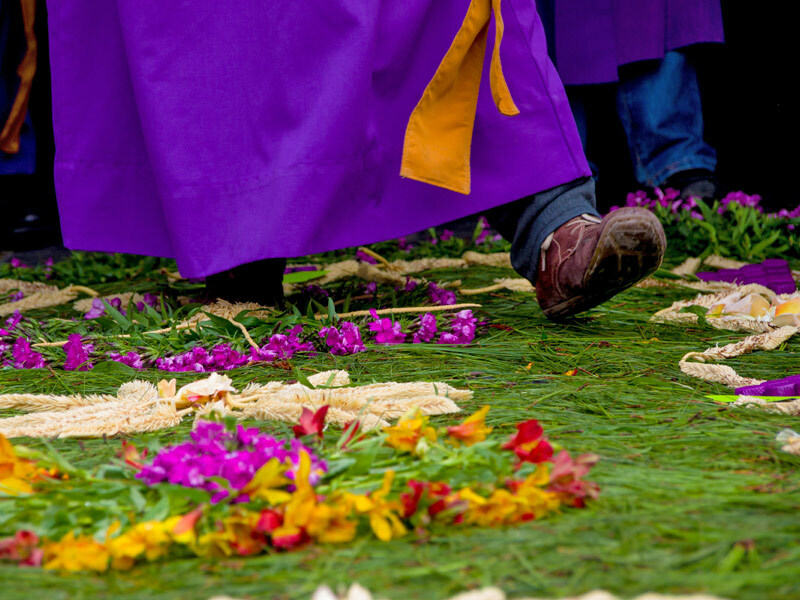 As the march of people passes over, the alfombras are destroyed, scattered beneath hundreds of shuffling feet. Creating an alfombra is an elaborate process that begins days—if not weeks—in advance. Sawdust is sifted so that it’s very fine before it’s dyed. A design—which can range from religious to ornate to cheeky—is chosen and a template is made. Several hours before a procession is scheduled to pass, a layer of sawdust or sand is spread on the street to create a level canvas on which the carpet-makers can work. A fine mist of water is sprayed over top, as well as during the carpet-making process, to ensure no sudden gust of wind blows it away (wind, rain, and the roaming street dog are a carpet’s biggest threats). Family and friends gather to work on hands and knees, often painstakingly applying a bit of sawdust one spoonful at a time to create their colorful designs. Many carpets are made of sawdust, though pine needles, wood shavings, bottle caps, and even tea bags as used, as well. Fruits, vegetables, and flowers like carnations, bougainvillea, chrysanthemums, and roses are often added as finishing touches. The best carpets have fine details and crisp edges. The best design is a matter of opinion, as you’ll see biblical depictions, geometric layouts, and odes to anniversaries and football (soccer) teams, as well as more whimsical images, like palm trees on the beach. Carpets are made for every Lent procession, but one of the best times to see them is before the early-morning Good Friday march from La Merced church. Starting around 9:00 p.m. on Thursday, alfombra-makers begin laying the foundation for their carpets. They pick up speed at midnight and finish before the procession’s departure from La Merced at 4:00 a.m. Myriad people take to the streets in the wee morning hours to pick out their favorite designs, for come sunrise, many of the carpets are gone.